The SMCPWR-INJ4 is an IEEE802.3af compliant PoE (Power over Ethernet) 1-port injector that combines power and data signals. By using the SMCPWR-INJ4, an external power adapter will no longer be required. 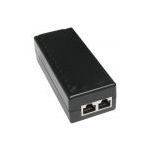 Utilizing a standard Category 5 Ethernet RJ-45 cable, the power and data can be combined (injected) into the Ethernet RJ45 Cat.5 output cable and fed into the PoE enabled devices such as SMC2552W-G2, SMC2555W-AG2, SMCE21011 or SMCWHSG14-G access points/hotspot gateway to provide both power and data signals. It will reduce your network installation costs and increase the flexibility, especially in locations where electrical power sources are difficult to get.